Continuing on my World Heritage Sites series, now in Beijing. 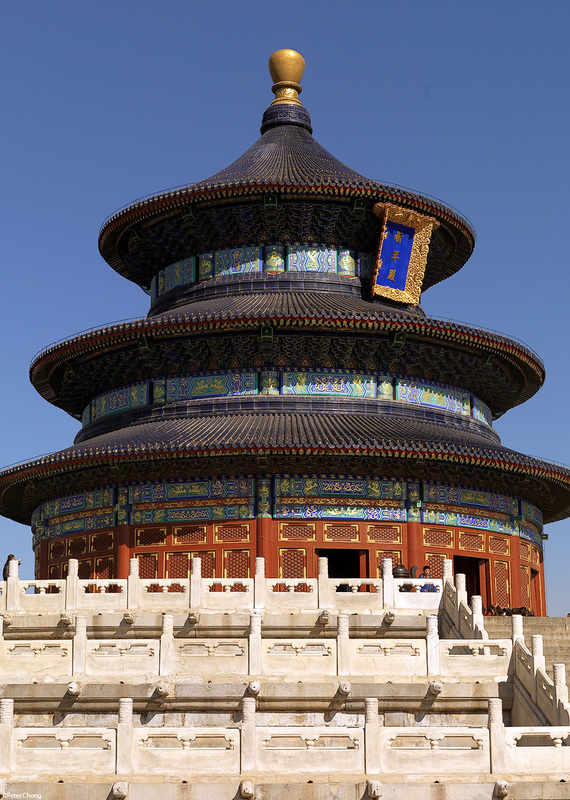 The Temple of Heaven is a place where the Emperor used to worship and pray to Heaven for a good harvest. The building is spectacular, in an equally spectacular grounds. Architecturally, it is a magnificent achievement. Said to be the largest timber building in Beijing...I am not sure, as I think there is a similar claim for one of the buildings in the Forbidden City, another World Heritage Site, and subject of a future article. Anyway, the place is beautiful, and worth spending an morning or afternoon in. The main building, which houses the worship hall. And a pano of the main grounds. There are literally people everywhere...tourists from outside China and within abound. And it was difficult to take a photograph without any people around...but I guess with people in the picture will give us a sense of scale and the feeling of the buzz which is in China these days.